All winter long we eat a variety of soups, stews and chili so I’m always up for trying new recipes to add to our regular rotation of favorites. This recipe is going at the top of my list! The flavor the first day was good but each day after it just got better and better. It’s not a spicy hot chili but it has a deep, rich, slightly smoky flavor and is full of fiber and healthy protein. This recipe will feed a crowd – think -Super Bowl Sunday. Perfect for a Meatless Monday menu too. My only regret is that I didn’t freeze some of it. I took inspiration for this recipe from a Cooking Light recipe but in typical fashion it was changed to accommodate ingredients I had in stock, like this soy chorizo. This was purchased at Trader Joe’s and placed in the freezer until I could figure out what to do with it. I had seen a recipe on the web that called for soy chorizo but once I had the product at home I couldn’t remember where I saw the recipe. Do you ever do that? Sometimes brain-fade strikes. 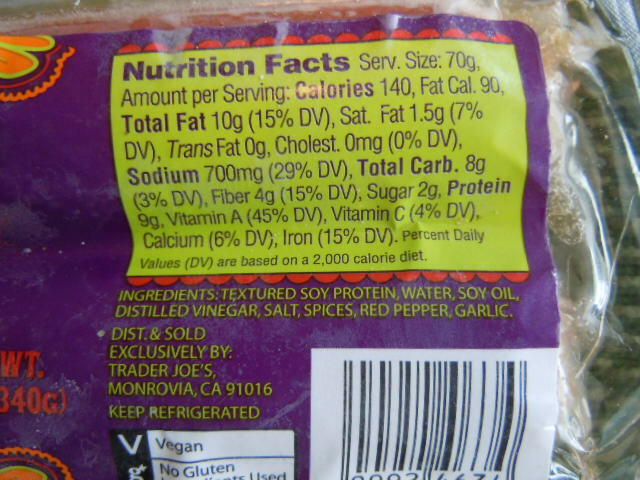 If you don’t have a Trader Joe’s don’t worry there are other brands of soy chorizo – look in the vegetarian section at your grocery store, Whole Foods or health food store. This package contains about 5 servings. Remove the casing before cooking the chorizo. I like saying Chorizo – what a fun word. I know I’m dorky like that! It is crumbly like ground beef and very flavorful but not spicy hot. If you want to ramp up the heat in the chili you can add more chipotle peppers, a jalapeno or some hot sauce. I thought it was perfect as is but we all like different levels hot and spicy. 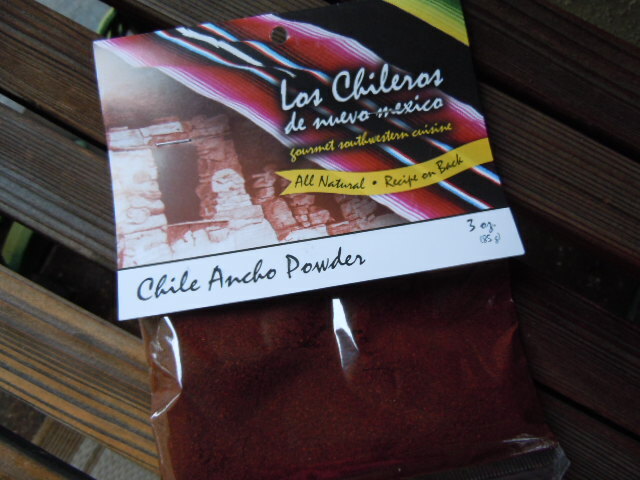 Made from dried Pablano chilies this Ancho chili powder has a mild smoky flavor. It has a deep red color and is popular in Mexican cooking often used in mole sauce. 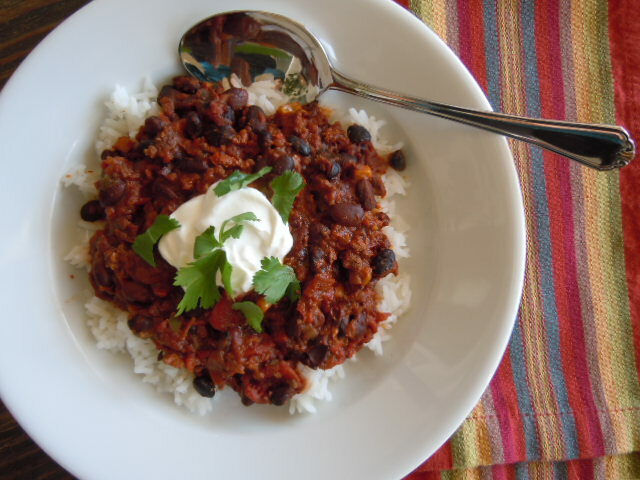 I thought it was perfect for this chili recipe but you can use your favorite chili powder. This was found in the Mexican food section at the grocery store. This was made in my slow cooker but I am also giving you stove top directions. I think the flavor of chili improves when it is allowed to simmer for a while so it usually ends up in my slow cooker. Plus I like prepping dinner earlier in the day and by evening it’s ready to eat. To make this extra special I served this up with a batch of hot, savory Cornmeal Scones with butter and honey. Of course Cornmeal Muffins would be equally as delicious or how about a loaf of hot Whole Wheat Beer Bread. Heat a large skillet sprayed with non stick spray over medium high heat, add chorizo removed from casings, onions, bell peppers, garlic and diced chipotle peppers, sauté for 6-8 minutes or until vegetables are tender. Add chili powder, cumin, oregano, cinnamon and lemon juice, stirring to combine. Transfer to a slow cooker and add the beans, tomatoes and corn. Turn on high for 2-3 hours or low for 4-6 hours. About 15 minutes before serving add chopped chocolate and salt and freshly ground black pepper to taste. Stir well to combine. Heat a large Dutch Oven that has been sprayed with non stick spray over a medium heat,add chorizo removed from casings, onions, bell peppers, garlic and diced chipotle peppers, sauté for 6-8 minutes or until vegetables are tender. Add chili powder, cumin, oregano, cinnamon, lemon juice, beans, tomatoes and corn. Bring to a boil, reduce to a simmer, cover, simmer for 30 minutes, stirring occasionally. Remove from heat, stir in chopped chocolate and season to taste with salt and freshly ground black pepper. Servings suggestion- serve over 1/2 cup cooked rice, baked potato or with baked corn tortilla chips. Garnish as desired. Recipe inspired from a Cooking Light recipe but made vegetarian and adapted to a slow cooker. How was your weekend? I took it easy and had plenty of couch time which really helped with the swelling in my foot. I still can’t wear a shoe – my foot is too chubby! It’s a huge disappointment as that would be one more step towards normalcy. Patience is a virtue but I’m not feeling very virtuous right now. Yesterday I felt like the walls were closing in on me so hubby Tom took me out for a short drive and we stopped for a quick bowl of soup and a sandwich. It helped with the cabin fever. In the afternoon I had more couch time with a season two Downton Abbey marathon! It helped me remember what all had happened in preparation for last nights premier episode of season three. Best PBS series ever! Shirley MacLaine was a nice addition to the cast. The scenery, photography, costumes and the characters are all amazing. I taped it so I can watch it again! Thanks for taking the time to stop by – won’t you please leave a comment and let me know you were here. Ah, Tami – wish the foot was better but yes, patience so it get batter.. HUGS!!!! Glad you got out though with your wonderful hubby! Just getting out every few days really seems to help! It’s not easy being trapped at home and it’s been too cold to sit outside on the patio. This too shall pass! I’ve heard a lot of good things about Downtown Abbey. I’ll have to add it to my list of shows to watch. Is it available thru Netflix, by chance? 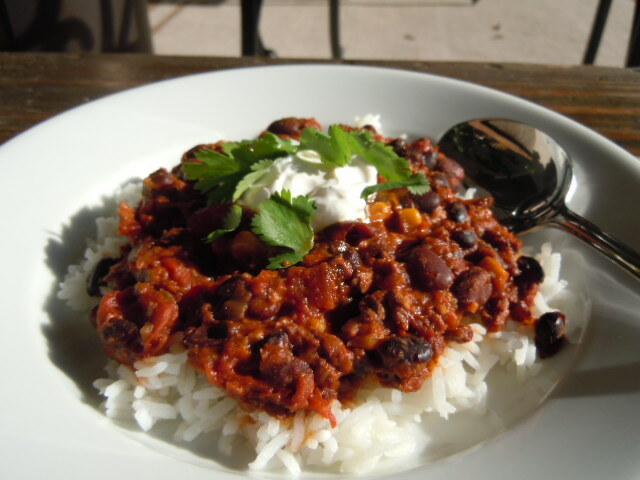 I absolutely adore chili and this looks fantastic! I am going through Trader Joes withdrawal here in Florida. Amazing how quickly I got attached once I had one at home. Would you believe there is only one in the entire state of Florida and it is in Gainesville. Probably no surprise there since it is where the University of Florida is located, but over 100 miles from me here in Flagler Beach. Found a neat looking health food grocery in Ormond Beach much closer to me, so I’m going to check it out this afternoon after putting Bill on a plane bound for Tennessee (sob)! Your recipe today looks delicious! Oh Sharon we do get use to certain shopping habits in a hurry! I hope you have good luck at the Health food store and discover some great finds! As much as I love to cook, I was in kind of a mood of nothing sounding good to prepare. Yesterday, I was making a grocery list, but frankly still fairly uninspired. Until I read your post, that is! I saw the black bean and chorizo chili recipe and was on a mission. Of course, I had to improvise since soy chorizo is not available in my small town. 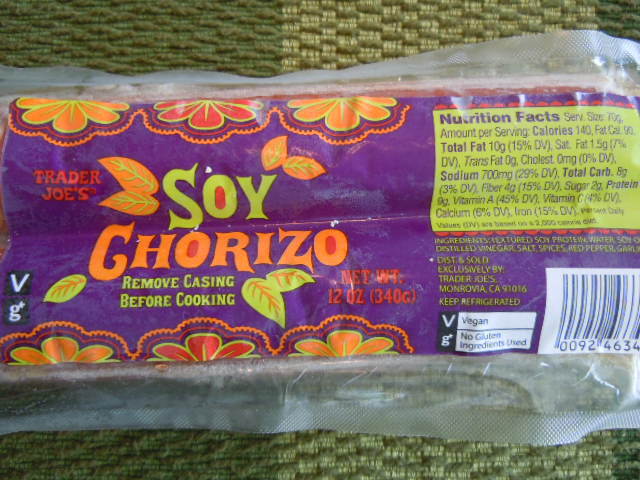 I found regular chorizo, but it was too full of fat for me. I found some pork and chicken sausage and doctored it up according to some info I found on the Internet. After MUCH chopping, it is now in the crockpot. My house smells delicious and I cannot wait for supper since I think it is just perfect for this cold and rainy day! I can totally relate about not always telling my husband ALL the ingredients. The chocolate is in a covered custard cup ready to add at the last minute, but it is not in a prominent place. I have put it in chili before, and the mealtime discussion revolved around whether or not we could taste the chocolate. I want him to go into it with an open mind. LOL! You inspired me to watch Downton Abbey. My friends have suggested it, but I keep forgetting about it. I ordered seasons 1 and 2 from Amazon, and I bet I will soon be a fan! If I was reading correctly, season 3 is also available to order, but I thought that was just now showing on PBS. I hope your foot gets better! Prayers! I loved reading all about your adventure in getting the chili made. Great idea to make your own version of chorizo without all the fat. Brilliant! I can relate to feeling uninspired to cook. That has been happening most of the time for me lately. I had to chuckle at your keeping the addition of chocolate a secret until after dinner so your hubby would be eating the new chili recipe with an open mind. Love it! I hope you enjoy Downton Abbey as much as we do. Yes, season 3 is available on DVD even though it is only now showing in the US on PBS it has already aired in Great Britain. It’s fabulous and quite addicting! The chili was FABULOUS! Definitely a keeper recipe! I spilled the beans—bad pun intended!—about the chocolate at the end of the meal. We agreed that the flavors were a delicious blend and that the chocolate contributed but did not stand out. The great news is that I also have some ready for the freezer! Last time we were over the border at TJ’s, we picked up some of the soy chirizo. It’s really tasty. Even my soy averse husband agrees. Thanks for the recipe Tami! You are so welcome Roz! so so so feeling for you and the longing for FOOTnormalcy.